I can’t believe we’re dealing with this again. Less than a year after the Department of Education dismissed a frivolous administrative complaint filed by the Asian American Coalition for Education (AACE) against Harvard University, the AACE has now announced it will file a nearly identical administrative complaint against Yale University, Brown University and Dartmouth College. In their complaint against Harvard, AACE alleged — absent any significant evidence — that race-conscious affirmative action discriminates against Asian American applicants. This work bolsters efforts by conservative partisan and lobbyist Edward Blum, who has made a career out of opposing civil rights measures for people of colour. Blum is best known as the architect of the Fisher v. University of Texas Supreme Court cases, which is the Right’s latest campaign to invalidate affirmative action in higher education. Outside of his interest in ending race-conscious affirmative action, Blum has backed numerous Supreme Court cases to reverse portions of the Voting Rights Act and to silence voters of colour. In the recently defeated Evenwel v. Abbott Supreme Court case, Blum and his fellow litigators argued that districts should be drawn so as to disenfranchise thousands of non-voting citizens, who are predominantly young people and people of colour. (AAAJ-AAJC talks about how Evenwel v. Abbott would have resulted in the disenfranchisement of numerous AAPIs). Edward Blum is clearly no ally of the AAPI community. So, one must wonder why some Asian Americans would support his causes. AACE’s complaint against Harvard was dismissed by the Department of Education last year on the grounds that it was too similar to a lawsuit filed by Blum against Harvard and the University of North Carolina. In reality, “too similar” is an understatement: I pointed out last year that not only did AACE clearly coordinate the timing of their complaint to coincide with Blum’s pending lawsuit, but the AACE’s complaint contained language virtually identical to that found in Blum’s legal filing. Stymied in their filing against Harvard, AACE has now turned their attention to Yale, Dartmouth and Brown. In a summary of their pending administrative complaint, dated November of last year but published to the AACE website last week, AACE references most of their same talking points. Again, there is the tired misinterpretation of the Espenshade study. Again, there is reference to the work of conservative lobbyist Ron Unz, who is also known for launching numerous hostile campaigns targeting California’s undocumented population. Again, the lawsuit cites the widely debunked Mismatch Theory research of Richard Sander. Again, the lawsuit makes the scurrilous and inflammatory comparison between race-conscious affirmative action — a policy designed to correct the effects of institutional racism and which historically and currently benefits Asian Americans among other people of colour — and Chinese Exclusion or Japanese American incarceration, a parallel so ahistorical as to be offensive. Unfortunately, AACE’s anti-affirmative action efforts have succeeded in garnering significant mainstream media attention to the exclusion of the majority of Asian Americans who actually support race-consicous affirmative action. Instead, mainstream media typically writes about these administrative complaints in a way that flattens and ignores the politics and lived experiences of the actual AAPI community. So, if you are a reporter who has arrived at this post as part of your research on Asian Americans who oppose affirmative action, here’s what you need to know. The AACE consists of over 100 civil rights organizations, and the vast majority are Chinese American. Most AAPIs are not Chinese American. The AAPI community is the fastest-growing community of colour in the United States, and we currently make up more than 5% of the population. 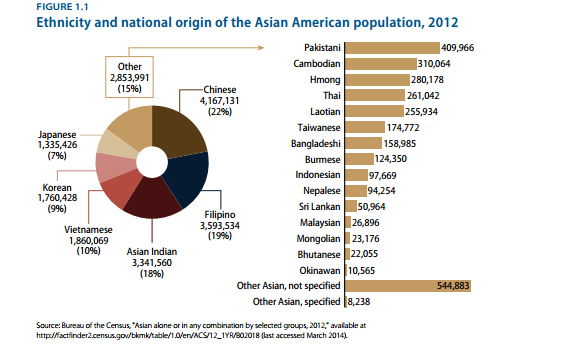 Only 1 in 5 of AAPIs are Chinese American. This is important because on this — as well as many other issues — the vast majority of mainstream outlets have failed to solicit the opinion (or even mention) non-Chinese AAPIs, many of whom experience disparities in higher education access that would clearly qualify these AAPIs for additional consideration under race-conscious affirmative action policies. High school and bachelor’s degree attainment rates are far below the national average for many Southeast Asian Americans and Pacific Islanders, and most of these communities remain profoundly underrepresented in our nation’s colleges and universities. Yet, rather than to advocate for struggling AAPIs, Asian American groups associated with anti-affirmative action efforts have gone on the record to actively oppose data disaggregation efforts in California that would reveal the institutional obstacles faced by Southeast Asian Americans and Pacific Islanders; this despite the fact that many Southeast Asian American groups have declared the data disaggregation fight one of the leading civil rights issues facing AAPIs today. The Southeast Asian Resource Action Center (SEARAC) highlights data disaggregation as the first necessary step in implementing state and federal policies to better serve these profoundly marginalized groups. Surveys repeatedly show that 60-70% of AAPIs — including 60-70% of Chinese Americans — support, not oppose, affirmative action. 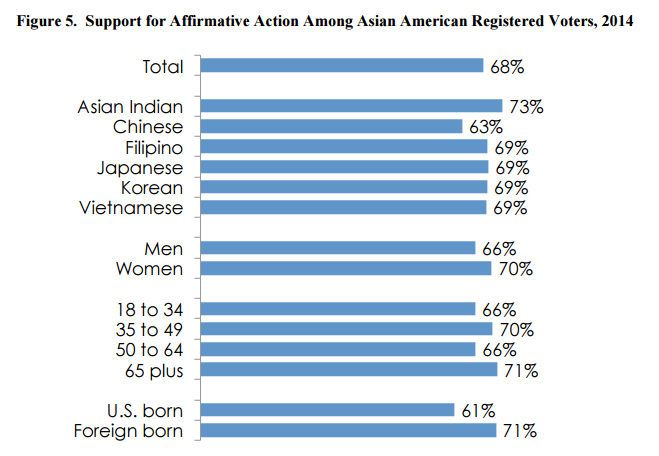 An updated survey released today by the same group of researchers shows that a majority of AAPIs, including 60-70% of Filipino American, Japanese American, and Vietnamese Americans continue to support affirmative action, although support has decreased among Chinese Americans, suggesting that the last few years’ anti-affirmative action messaging has had an impact on members of this ethnic group. In fact, more than 135 (and counting) national AAPI civil rights organizations whose work span virtually all ethnic identities counted within the AAPI umbrella have come out in support of affirmative action and in opposition to Blum’s efforts to co-opt our community for his conservative agenda. I’m not saying that either side “speaks for” the AAPI community; none of us do. Rather, it is imperative that journalists write in a manner that reflects the nuanced ideological diversity within the AAPI community. One can not — or at least, should not — write about one side of this debate within the AAPI community without also writing about the other. Given that this second administrative complaint is clearly part of a larger partisan effort to advance a conservative agenda, it can no longer be allowed to stand immune to journalistic criticism. Asian-Americans have the lowest acceptance rate for each SAT test score bracket, having to score on average approximately 140 point higher than a White student, 270 points higher than a Hispanic student and 450 points higher than a Black student on the SAT, in order to gain admission. This is, quite simply, not what Espenshade’s data show. Espenshade studied applicants’ probability of admission into highly selective colleges and universities without considering non-numerical applicant factors, and then — and this is important — artificially translated his results into an SAT score. His choice to do so helped market his study to a lay audience, but it also opened the door to sweeping misinterpretation. In fact, Asian American students do not need on average 140 more SAT points than White students, and 450 more SAT points than Black students to garner admittance to a highly selective university such as Yale or Harvard. In 2015, Asian Americans admitted to Harvard on average scored only 92 points higher than White students and on average only 250 points higher than Black students on the 2400 point scale. This is a far smaller range than the 140-450 point spread reported by Espenshade on the 1600 point scale, and all above the 2120-point baseline Harvard recommends for competitive applicants. The reason for this disparity is simple: Espenshade was not reporting actual differences in SAT score (his data are reported in units of “SAT point equivalents”) nor was he considering the vast majority of criteria currently used by universities to make admissions decisions. Indeed, Espenshade himself rejects the conclusion that his data are proof of racial discrimination against Asian American applicants. All this is mentioned, of course, without also discussing the fact that the SAT is a poor indicator of student merit or success, that it is highly biased against lower-income students and students of colour, and that nonetheless a 100-point difference in SAT score correlates to only about 1/10th of a GPA point in first-year courses. The complaints against Harvard and Yale also suggest that Asian Americans are the most underrepresented racial group at Ivy League schools relative to our applicant numbers. 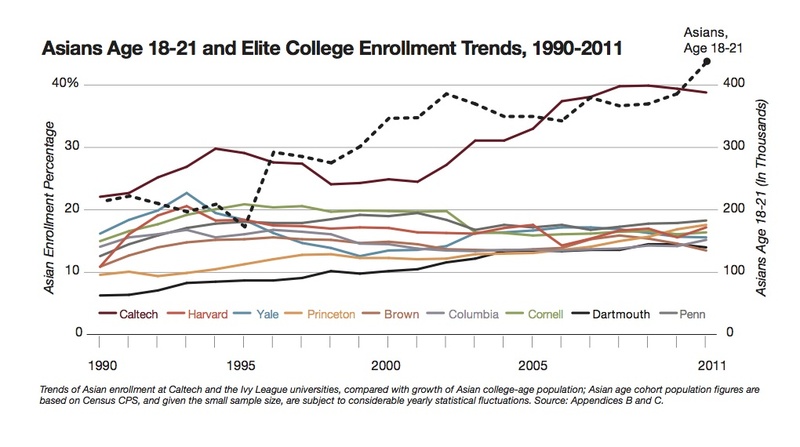 They cite an infamously misleading 2012 graphic generated by Unz for the New York Times as showing that Yale’s enrollment of Asian Americans peaked in 1993 at 16.8% and is progressively falling since that year. The graphic, in fact, shows that Yale’s Asian American enrollment in 1993 was more than 20% of the total admitted student population. While 1993 is clearly an anomalous year for Yale, in fact Asian American enrollment has been steadily rising since 1998, when Asian Americans represented about 11% of admitted students. Unz reported that in 2011, Asian Americans were 16.8% of admitted students. 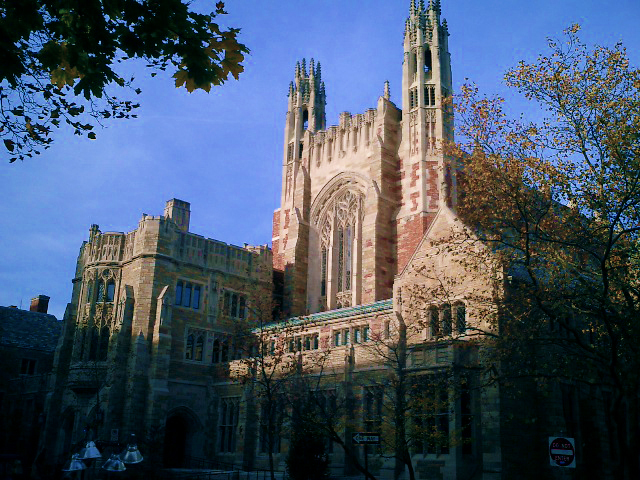 Today, Asian Americans are 18.5% of the student body at Yale, a 10% growth rate in less than five years. Despite the fact that even the most conservative admittance numbers for AAPIs result in our community being represented on Ivy League campuses at rates three-fold greater than the size of our national population, AACE insists that our students are underrepresented relative to our applicant numbers. We must pause to treat this charge with skepticism. AACE made this claim against Harvard, yet it turns out that Harvard’s admission rate of Asian American students (21% of those admitted are Asian American) is exactly equal to Asian American application rates (21% of applicants are Asian American) to the school. While the data aren’t available for other schools, with regard to Harvard, the group is clearly wrong on this point. The AAPI community is at a watershed moment in our political evolution. As we grow in size, the political diversity of our pan-ethnic identity is bubbling to the surface. That diversity, in and of itself, is a good thing: no group of people should be treated as a monolith, and I don’t begrudge any AAPI individual or civil rights group for doing community organizing work around civic engagement and civil rights, as they interpret those issues. I don’t have to agree with those who oppose affirmative action to laud the grassroots efforts of these organizers to energize and engage members of our community. That being said, AAPIs must confront perspectives that emerge from within our community that seek to erase members of the AAPI coalition, or that appear to be at odds with larger racial justice efforts. When those who oppose affirmative action appear before the California State Legislature to actively lobby against data disaggregation — an important civil rights issue for Southeast Asian Americans and Pacific Islanders — we have to wonder about whom these groups can really claim to represent within the AAPI diaspora, and whether their work can continue to go unchallenged by the rest of us. In 1966, sociologist William Petersen introduced ideas in an op-ed for the New York Times that would germinate into the modern Model Minority Myth. The fact that Petersen’s writing appeared in the New York Times — which also published the work of Ron Unz in 2012 to reinforce model minority stereotypes with regard to affirmative action — reveals the complicity of mainstream media in creating and perpetuating the Model Minority Myth, in part by failing to honestly report the nuance of the AAPI community; now is the time for mainstream journalists to correct that complicity by finally including those of us who would complicate the mainstream’s model minority narrative of our community. In his op-ed, Petersen highlighted the apparent economic and cultural successes of the Japanese American community in “overcoming” racial discrimination, and contrasted these achievements against the behaviour of those whom he dubbed America’s “problem minorities.” What becomes clear from this work is that the Model Minority Myth which would emerge from this and other writing is an overt reaction to the Civil Rights Movement that co-opts Asian Americans to suppress Black liberation. Asian Americans are positioned as a wedge against Black uplift, and this occurs regardless of who Asian Americans are or whether or not we embrace this treatment. It is incumbent that AAPIs work to dismantle model minority stereotypes, not reinforce them or their origins in anti-blackness. When some of us demand leniency for former NYPD police officer Peter Liang for shooting and killing unarmed civilian Akai Gurley, we undermine #BlackLivesMatter. When some of us file motions to challenge affirmative action, we reinforce the appropriation of our identity to service the Model Minority Myth. I reject the anti-affirmative action position on its face. There is plenty of work to be done around issues of AAPI racial justice. Educational and economic disparities paint a stark picture for Southeast Asian Americans and Pacific Islanders. Numerous public health issues disproportionately affect AAPIs. Implicit biases create a “bamboo ceiling” that limits employment and promotion opportunities for AAPIs. The Right’s campaign to end reproductive rights currently targets immigrant women of colour, including many AAPI women. The State Department routinely profiles and harasses Chinese American scientists and analysts, oftentimes ruining their careers. AAPIs face myriad injustices in today’s America. Ivy League universities, including Yale, are not without their own issues of institutionalized racial violence and bias. But, barring further and more compelling data, we cannot conclude that Asian Americans are subject to widespread racial discrimination at Ivy League universities due to affirmative action. Indeed, the evidence routinely shows the opposite: that affirmative action supports anti-racism efforts by improving access to higher education for underprivileged students of colour, and that its absence hurts AAPI students and all students of colour. I believe in education for all, and I refuse to be a wedge for conservative efforts to suppress people of colour, including other AAPIs. It’s time for mainstream journalists to reflect the fullness of the AAPI politic on this and all issues. Update (5/25/2016): This post has now been cross-posted at Angry Asian Man.